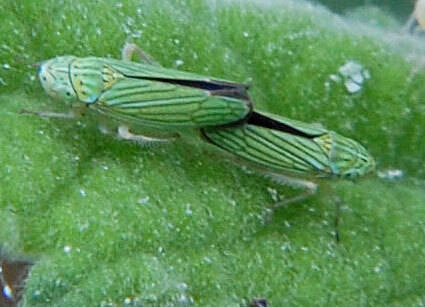 This pair of leafhoppers is sitting on the upper leaf surface of Canyon Ragweed (Ambrosia ambrosioides). Mazatzal Mountains, Maricopa County, Arizona, USA April 2009. Each is about 4 mm long. These hoppers were kindly identified by Andy Hamilton, a Canadian Entomologist. Leaf-hoppers of many, many species live upon the flora of the Sonoran Desert. Most are quite small, usually less than 6 mm in length. Bullet shaped and tapered at both ends they are capable of jumping with extraordinary speed. When disturbed their hind legs propel them like little rockets. Many species, like the one shown here, are colorful and boldly marked. As adults they can also fly; the immature leaf hoppers tend to be paler than the adults and lack functional wings; otherwise they are similar. Some leaf hoppers are quite specific about what plants they feed upon whereas others feed on many kinds. They feed upon sap within tender shoots using piercing-sucking mouthparts. And because they can fly from plant to plant they can also transmit plant pathogens such as viruses and bacteria. Female leaf hoppers have a sharp injecting device called an ovipositor with which they insert their eggs into plant tissue. Here the eggs are protected from drying and some predators. Small parasitic wasps (Mymaridae) can nonetheless find these hidden eggs and insert their own egg within the leafhopper egg.